In previous lessons I discussed about different layers and now I am going to Show you a sample code and discus what goes where. In this layer we are going to define business entities and interfaces. Also sometimes we may define enumerations since it should be understandable for all other layers. We may want log information so having a logger class here could be useful serving all layers. The best tool for logging information and bugs is NLog (I will explain how to work with NLog in future posts). We also need a serviceFacotry class to create proper object of Facade layer. 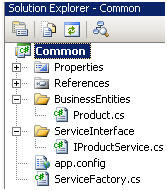 If you look at the architecture (previous lesson) you will see that UIProvider layer connect to facade layer but we may need to change this facade layer to a webservice so creating object from this layer should be configurable. One way is that a service factory can be used another way is using Spring. I will talk about Spring in future posts. Please look at the sample code. In This business layer we do not have any special business but let me give you an example if a user select bunch of products to buy then in this layer the price should be calculated. And then some code will be written here to withdraw his account. The responsibility of this layer is that make it easier for UI to connect to this layer without understanding the complexity of backend. Let me give you an example. In this layer we may add some code to log accessing to data also we may check security etc. Please see the code. What you need in UI may different in terms of object entities so you need add some modification or even create new objects to bind to UI elements. Moreover, you can test this layer so you know what is binding to UI. Best practice suggests that we should test this layer to sure about data which is going to be bind to UI. One of the best tools for testing is NUnit that I am going to talk about NUnit in next lessons. Main purpose of this layer is showing information to user and getting information from user. In our case this layer is a web application. As you see I applied a css (some free template form dear Google search). 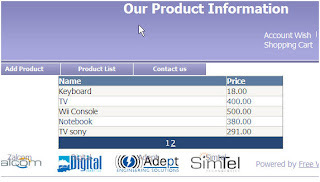 There is a Master page and also two pages, one page to add Product and another to see list of products. In both pages I used object data bindings. Please get the code. In next Lesson I am going to talk about NLog, Spring, NUnit and my favourite tool "code smith" to generate code automatically. I am sure you came up with the idea that this is really time consuming and you need something to speed up your implementation. Code smith helps you to generate code automatically and fast. Splendid, great job! Thanks for all you thought me.I owe you alot. I'm so happy see your web site and I can use your knowledge again. How is it going in Canada. I love this lesson and will be looking at using these concepts in my next project. Is there a way to not use the ObjectDatasource control? your description was something. you just saved my life. before reading your article on multi-tier architecture, I was so confused about this issue. Reading the article, I am able to develop my project based on this architecture. So many thanks to the greatest mentor ever.